On Friday the 10th of March, Quattro Foods attended and supplied the catering for Isabelle’s fundraiser; a spring jazz concert that raised money for Isabelle’s place on the World Challenge that will be taking place in Romania. It was a great night for all involved with some fantastic jazz entertainment at the Churcher’s College Assembly Hall in Petersfield. For those who aren’t familiar with World Challenge, it is an organisation that provides “education through exploration.” Regularly, they help students develop important life skills through encouraging team work and leadership, making them more globally aware and helping students gain more confidence and self-esteem. To help out, Quattro Foods ensured all guests at the concert were fed and happy. We created an array of different canapes for the event, such as: Mini fennel sausage rolls, smoked salmon with cream cheese on rye bread, serrano ham with goat cheese, roasted fig & rocket filling, mini pea tarts, red pepper & paneer skewers, sweet chilli king prawns & mange tout skewers, sticky beef spoons with sesame & coriander and pork and pepper koftas. 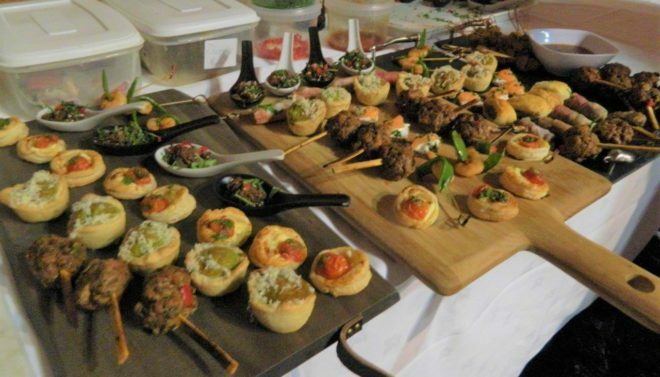 All of our canapes were all prepared with our signature home cooking style and they seemed to go down a treat! If you have an event coming up and are looking for a bespoke food solution to be the talk of the party, why not get in touch with a member of our food development team at Quattro Foods factory in Portsmouth? Whether you are looking for something frozen, fresh or ambient, we can help deliver a product that everyone will love. P.S. Looking to keep up with our latest food creations? Whether you are searching for menu ideas or are interested in our range of steak sauces, following us on Twitter will keep you in the know!